Hormones might ravage your body and mind during pregnancy, but I feel I must give credit where credit is due. They can also serve to inspire some yummy food combinations. When I was pregnant with Belle, I started to experiment with fruit in savory dishes. Sure those of you who grew up with pork chops and apple sauce were way ahead of me. But, I didn’t grow up with that. It started with plum and duck brochettes a few years ago, made during my pregnancy, and continued all the way to strawberry pizza last year. So this morning when I woke up with the chorizo runny egg combo from We are Never Full in my mind’s eye, I obediently went down to the kitchen and began to toil away. Chorizo sadly would set my tender stomach on a bender, so I decided to substitute spicy kidney beans. My husband, J--, was not only unconvinced, he was openly mocking (brave, stupid man, huh?). Well, I got the last laugh. He begged me for the last bite of my breakfast. This breakfast is my first entry about One Local Summer. In Cleveland, we are very lucky to have many many sources for local meat, dairy and vegetables (at least in the summer.) The kidney beans and onions were from the North Union farmer’s market. I tossed them with diced pickled tomatoes from last year’s garden and cilantro leaves from the garden this year. (I did also use cumin, salt and pepper from the pantry.) The runny egg was also local. The potatoes and pimenton, I am afraid, were not local. As a carbophillic, I couldn’t do without, but I found it hard to find a carb that is in season and local. Here’s to an even more local week next week. This sounds like a tasty and healthy breakfast. I am always looking for new ways to enjoy beans. Awesome. I totally love the adaptation of this dish. And I love that your husband was a nonbeliever! Kevin: try it. i bet you will enjoy it. meat eaters: thanks. isn't it nice to surprise a nonbeliever. Great idea. I think it looks great. So glad to be checking out your creations again. OHH Looks delicious. The kidney beans are a welcome and unexpected interpretation. While reading your post reminded me of my pregnancy too!! but I was the complete opposite I wasn't creative at all, I even hated eating :-) This is dish looks really delicious! My hubby will love this runny egg!! This looks tremendous! What a great combination of foods. I can't wait to see what else you have up your sleeve for OLS. 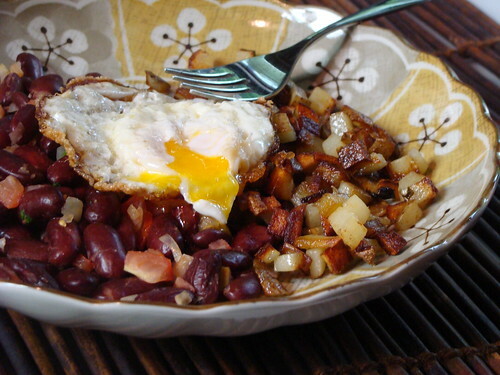 What a yummy breakfast, I know that the egg/bean combo is a delicious one -- so healthy too. What a great breakfast. Nice potatoes on the side. I love pimenton, and this looks delicious! Great for combination for breakfast or any meal. This would be a good hangover brekkie...hearty enough to jump start the body and get me ready for a Saturday night. Oooh, runny yolk. And hey, in the picture, it does look like there are diced chorizo in there!